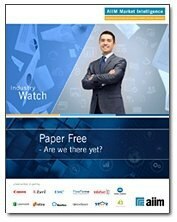 Free Report: Paper Free - Are We There Yet? Despite widespread acceptance that reducing and removing paper is a best practice, only 25% of survey respondents indicate they run a totally paper-free environment. Since the 1980s, we have been hearing about paper-free businesses and the drive to move toward a more digital workplace. So what's getting in everyone's way?